It is the last day of summer lab work for the Archaeology in Annapolis project. Out of the sun of the field and into the air conditioning, volunteer undergraduate students Bill and Ryan wash the artifacts gathered from this season’s efforts. Toothbrushes in hand, they dust off the delicate or brittle artifacts made of bone or iron and scrub the hardier finds with water. Free from dirt, the ceramics and glass pieces sometimes reveal maker’s marks and unseen decorations. These features will be eventually cataloged and aid in the analysis of the site as they can provide relative dates for the levels in which they were found. Under the guidance of graduate student Kate Deeley, the volunteers learn the basics of laboratory methods, while she and the other graduate students work on their own research—independent but each related to the Archaeology in Annapolis collective. Artifacts from the Pinkney House in Annapolis lay out to dry on screens. Source: Kate Deeley. 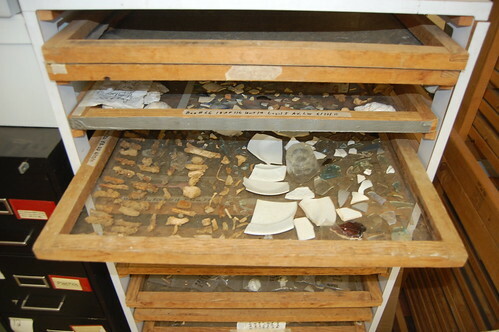 Archaeology in Annapolis is a 30-year project, run out of the University of Maryland, College Park. Under the direction of Dr. Mark Leone, a staff of graduate students—Jocelyn Knauf, Amanda Tang, Kate Deeley, Benjamin Skolnik, and Beth Pruitt—manages annual field schools and lab work, which contribute to their individual dissertation research. In the summer, the field school spends three weeks in urban Annapolis, Maryland and three weeks at the Wye House plantation on the Eastern Shore. As Archaeology in Annapolis learns about the lives of past people, we strive to explore the stories of those whose names haven’t always made it into the history books, including enslaved African Americans and working class individuals.